The Nigerian Air Force (NAF), has said that the helicopter carrying Vice President Yemi Osinbajo, which crashed yesterday in Kogi State, was not part of its fleet. According to a statement by its spokesman, Air Commodore Ibikunle Daramola, Sunday morning, NAF also said that the crashed aircraft was not from the Presidential Air Fleet (PAF), as erroneously insinuated in some quarters. NAF asked the general public to disregard all false news and the misleading videos which suggest that the helicopter belonged to Air Force of PAF. 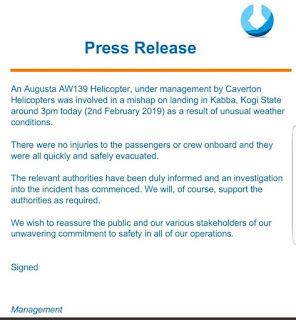 Below is the full statement signed by Air Commodore Ibikunle Daramola. 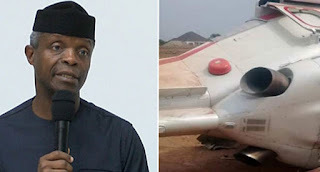 “The attention of the Nigerian Air Force (NAF) has been drawn to various reports in the media purporting that the Augusta AW139 Helicopter, which was involved in a mishap in Kabba, Kogi State yesterday, 2 February 2019, while conveying the Vice President, Professor Yemi Osinbajo, belonged to the NAF or was from the 011 Presidential Air Fleet (011 PAF). Some unscrupulous/undiscerning individuals have even gone so far as to circulate a video showing the crash landing of a military helicopter, from an unrelated incident, which neither occured in Nigeria nor involved NAF or 011 PAF aircraft, portraying it as the one that crashed in Kabba. The NAF wishes to state categorically that the helicopter that crashed in Kabba does not belong to the NAF or 011 PAF. 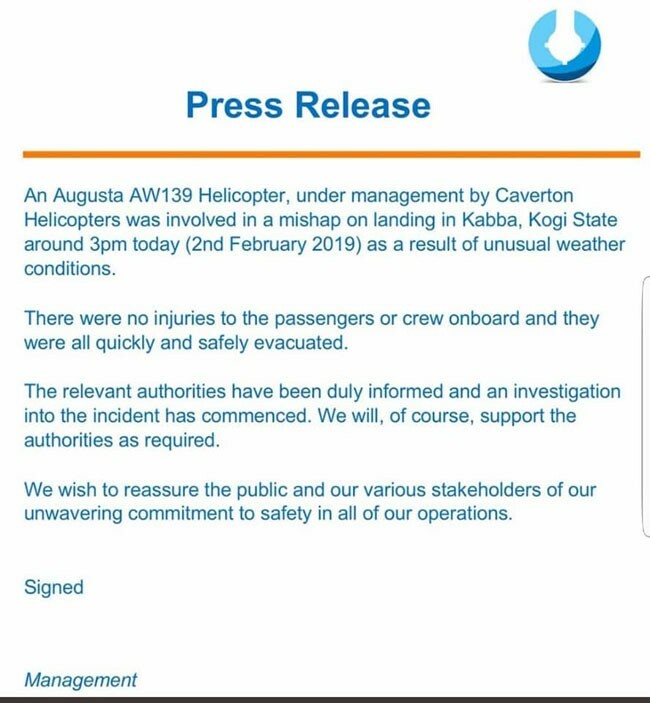 The owners/operators of the civilian helicopter, Messrs Caverton Helicopters, have already issued a statement on the matter. In addition, the military Dauphin Helicopter, painted in desert camouflage colour, seen in the video circulating on social media does not belong to the NAF and should not be misrepresented as belonging to the NAF. Accordingly, the general public is advised to disregard such erroneous information and the misleading video.